[272 Pages Report] The global oligonucleotide synthesis market is valued at USD 1.33 Billion in 2016 and is projected to reach USD 2.46 Billion by 2022, at a CAGR of 10.9%. The base year considered for the study is 2016 and the forecast period is from 2017 to 2022. The study estimates the market size for 2017 and projects its demand till 2022. In the primary research process, various sources from both demand side and supply side were interviewed to obtain qualitative and quantitative information for the report. Primary sources from the demand side include research scientists, biotechnologists, synthetic biologists, and academic research institutes. For the market estimation process, both top-down and bottom-up approaches were used to estimate and validate the market size of the oligonucleotide synthesis market as well as to estimate the market size of various other dependent submarkets. All possible parameters that affect the market covered in this research study have been accounted for, viewed in extensive detail, verified through primary research, and analyzed to get the final quantitative and qualitative data. This data was consolidated and added to detailed inputs and analysis from MarketsandMarkets and presented in this report. Secondary sources such as directories; databases such as D&B, Bloomberg Business, and Factiva; white papers; annual reports; company house documents; investor presentations; and SEC filings of companies were referred. The oligonucleotide synthesis market is highly competitive with the presence of several small and big players. Prominent players in the market include Integrated DNA Technologies (IDT) (US), Sigma-Aldrich Corporation (US) (part of Merck KGaA), Eurogentec (Belgium), Eurofins Genomics (Germany), Agilent Technologies (US), Thermo Fisher Scientific (US), BioAutomation (US), LGC Biosearch Technologies (US), GeneDesign (Japan), GE Healthcare (US), TriLink BioTechnologies (US), GenScript (China), Nitto Denko Avecia (US), ATDBio (UK), Bio-Synthesis (US), IBA GmbH (Germany), Gene Link (US), and AITbiotech Pte. (Singapore). The global oligonucleotide synthesis market is expected to reach USD 2.46 Billion by 2022 from USD 1.47 Billion in 2017 at a CAGR of 10.9%. The growth of this market is mainly driven by the increasing research activities in the pharma and biotech sectors and the rising demand for innovative diagnostic and therapeutic techniques. This report segments the market into product, application, end user, and region. Based on product, the market is segmented into synthesized oligonucleotides, reagents, and equipment. In 2017, synthesized oligonucleotides are estimated to account for the largest share of the total market, followed by reagents. The growth of the synthesized oligonucleotides segment is attributed to the increasing number of applications of synthesized oligonucleotides in research, diagnostics, and therapeutics. Based on product, the synthesized oligonucleotides market is segmented into primers, probes, large-scale synthesis oligonucleotides, intermediate-scale synthesis oligonucleotides, and linkers & adaptors. Primers are expected to account for the largest share of the synthesized oligonucleotides market in 2017. The intermediate-scale synthesis oligonucleotides segment is projected to register the highest CAGR, due to the rising demand for synthesized oligonucleotides and innovations in manufacturing techniques to produce intermediate-scale oligonucleotides. 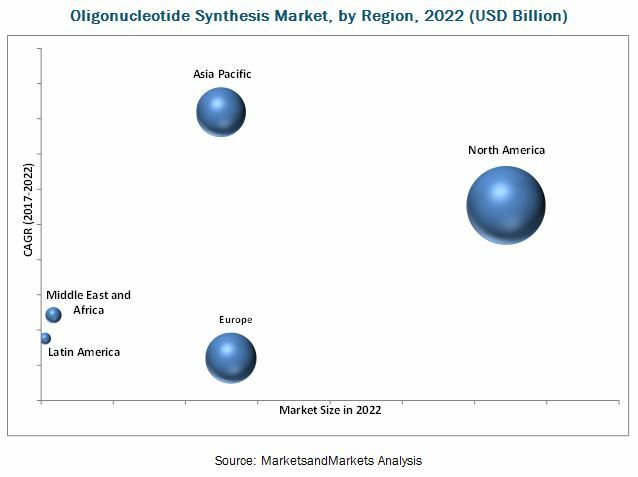 Based on end user, the oligonucleotide synthesis market is segmented into academic research institutes, pharmaceutical and biotechnology companies, diagnostic laboratories, and other end users. The diagnostic laboratories segment is expected grow at the highest CAGR during the forecast period. This growth is attributed to the rising diagnostic applications of oligonucleotides and the growing field of molecular diagnostics. In 2017, North America is expected to dominate the market followed by Europe. Asia Pacific is expected to grow at the highest CAGR during the forecast period. This can be attributed to factors such as the growing availability of synthesized oligos, along with an increase in R&D funding and activities in the APAC region. The increasing focus of prominent players on APAC is also supporting market growth in the region. However, price erosion and a lack of regulations for therapeutic oligonucleotides could hinder the growth of this market to a certain extent. The oligonucleotide synthesis market is highly competitive with the presence of several small and big players. 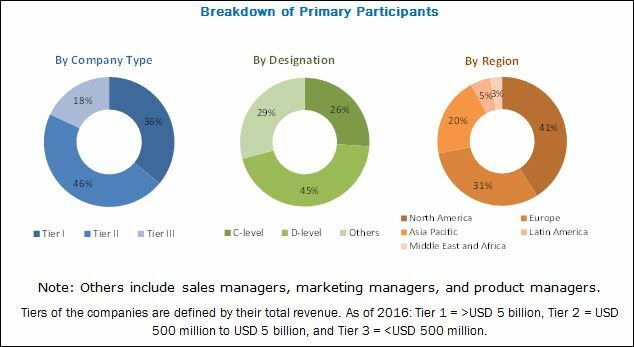 Prominent players in the market include Agilent Technologies (US), ATDBio (UK), Bio-Synthesis (US), BioAutomation (US), LGC Biosearch Technologies (US), Eurofins Genomics (Germany), Eurogentec (Belgium), GeneDesign (Japan), GE Healthcare (US), GenScript (US), Integrated DNA Technologies (IDT) (US), Nitto Denko Avecia (US), Thermo Fisher Scientific (US), TriLink Biotechnologies (US), and Sigma-Aldrich Corporation (Sigma-Aldrich) (US) (part of Merck KGAA (Germany)).